Slay the Spire full version free download torrent. Slay the Spire free download game for PC setup highly compressed iso file zip rar file. System Requirements of Fallout. 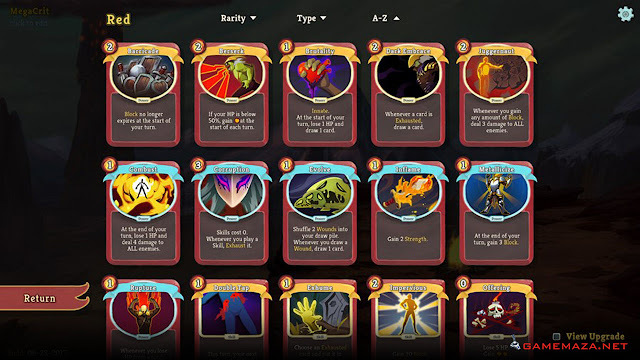 Free download Slay the Spire PC game high speed resume able (resumable) download fully working game. Slay the Spire PC game torrent download max speed max health torrent. 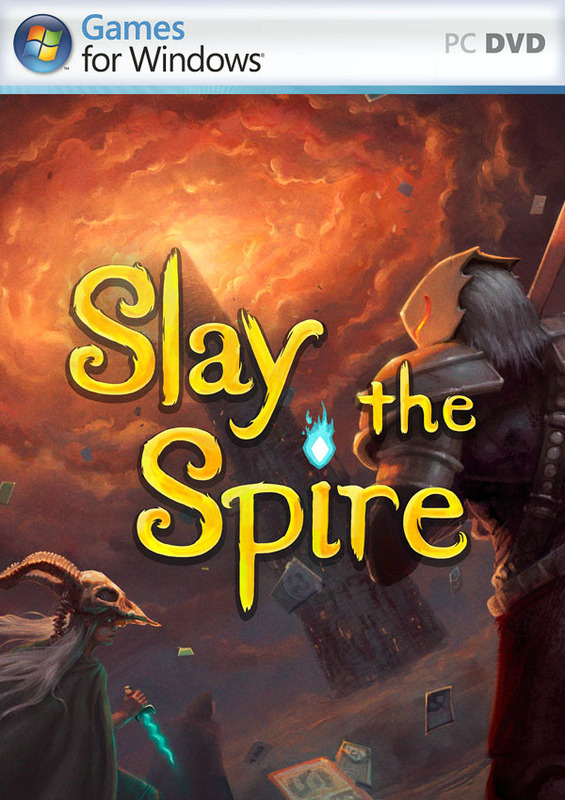 Slay the Spire full version game torrent download max seeders torrent. The joy of a singleplayer card game like Slay the Spire is that it puts absolutely broken combos within your grasp. It feels good to deal 50 poison damage to something. But it feels even better when you drop a series of cards that sextuples that amount of poison, kills an enemy, and triggers a corpse explosion that cascades splash damage to all of the other things that are trying to kill you. 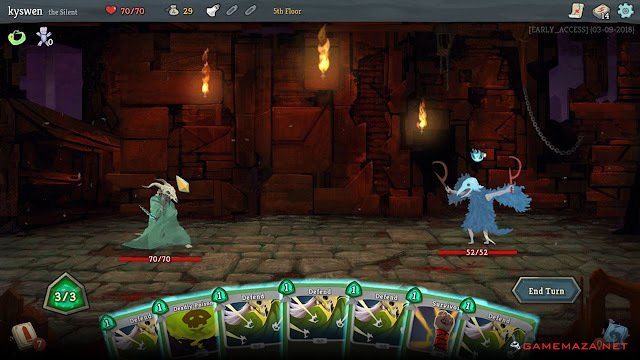 Slay the Spire is zeroed-in on this feeling of linking cards together to produce avalanches of damage, defense, or utility. Plenty of games put this domino-effect sensation at the center of their gameplay loop, like when you collect enough Diablo gear to unlock some obscene damage multiplier, or when you Call enough Duty to temporarily become a helicopter. Slay the Spire's achievement is the way it makes this feeling of power simultaneously so potent and elusive. This is an intricately designed deckbuilding game grounded in deliberate balance, populated by confounding enemies, steady rewards, and tactile decks of cards that play like efficient, beautiful machines of your own creation. Slay the Spire splits its 283 cards into three siloed archetypes (The Ironclad, The Silent, and The Defect), characters that are as asymmetrical as StarCraft's Terran, Protoss, and Zerg. But the fantasy monsters that stand between you and the top of the spire don't play cards of their own. Instead, they fight sort of like Pokémon, inflicting damage, pesky status effects, or buffing themselves each turn. These actions are telegraphed in advance by UI and, like our most recent Game of the Year, provide near-perfect information. The good outcome of this design is that I never feel cheated when I die, rare for a roguelike or card game, let alone one that intersects the two. Over wins and losses, you start to see the way small decisions pile up into larger outcomes. I could usually trace a defeat back to a moment of greed, a hurried misplay, or an ill-advised card pickup. Slay the Spire isn't Magic: The Gathering or Hearthstone, but a good thing it has in common with those competitive games is that it makes adding any one card to your deck a non-trivial decision. There's enough margin for error given, but I've doomed dozens of runs just by picking a couple bad cards. Luckily the epiphanies that result from my own failure are gratifying, with each discovery uncovering some unnoticed layer of depth. 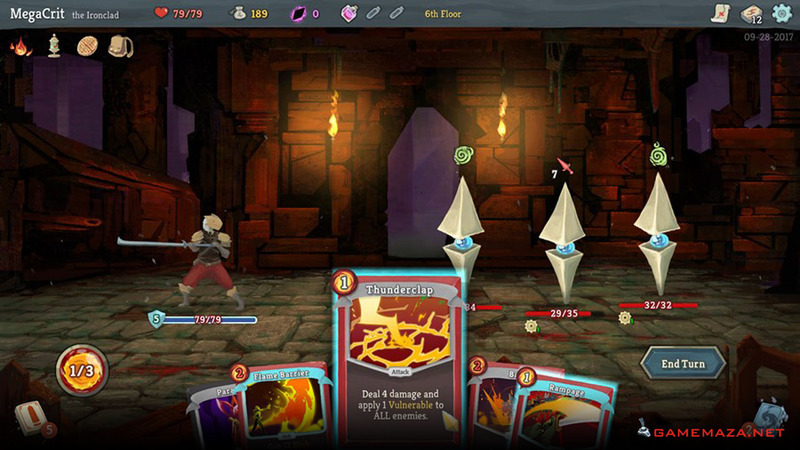 The Defect, Slay the Spire's robotic character, for example, starts each run with a relic that summons a lightning orb, one of four, elemental energies that can occupy vacant slots encircling The Defect. To my naive eyes, this character was about lightning, and my initial runs were spent hoovering up as many cards as I could that made lightning orbs. I'd always grab multiple copies of Storm, a power card that summons a lightning orb whenever I played another power card. Free lightning! It felt great to end each turn and watch my family of floating green balls dish out randomly-targeted zaps. This build would sometimes push me into Slay the Spire's third act, but eventually it'd get my robot face kicked in by the first monster that dished out big, turn-one damage. However much lightning I filled my deck with, it'd still take three or four turns to bring it out, and by then, I'd be dead. Simply knowing Slay the Spire's combos or best cards isn't enough to earn a win. Your willingness to abandon your sweet deck idea when the RNG isn't serving up, say, loads of lightning orb cards for the Defect is itself a skill. You're building an airplane as you fly it, from partially randomized parts, through an FTL-style web of varied encounters and events. Which path you take up the spire is a fun test of your ability to weigh long-term goals against short-term needs. Like the decisions you make deckbuilding, learning when to detour is a skill, and different strategies are viable. The moment an act's map procedurally generates, I'm eyeballing which route takes me past the most campfires, rest points where I can either permanently upgrade a card or heal. But in earlier acts, I also want to fight as many Elite enemies as I can, which drop relics—unique equipment that contributes crucial buffs or triggers like "Whenever you discard, gain 3 block." Some of the best runs have been when I make the tough decision to fight a bunch of enemies in order to reach a merchant, just for the potential payoff of buying an essential card that might be there. Random events also line the path, and while some pose interesting choices (like whether to halve your max HP in exchange for vampirism), my complaint is that some of the events have clearer-cut good and bad choices. I'd also love to see a few extremely rare events, something that produces that one-in-a-thousand feeling I get when The Mysterious Stranger shows up in Fallout. A little remarkably, there are moments when Slay the Spire feels like a turn-based fighting game. The audio does most of this work, serving up expressive sounds that convey motion and impact in addition to training your brain on fine details like status effect triggers. The glacial crunch when my Defect drops multiple frost orbs is ear candy. Ditto the quintuple-tap thud of the Silent's Flechettes against a lifebar, or the toxic clink of Bouncing Flask as it spills poison over random enemies. One deck type for The Silent became one of my favorites because of the sound it made. 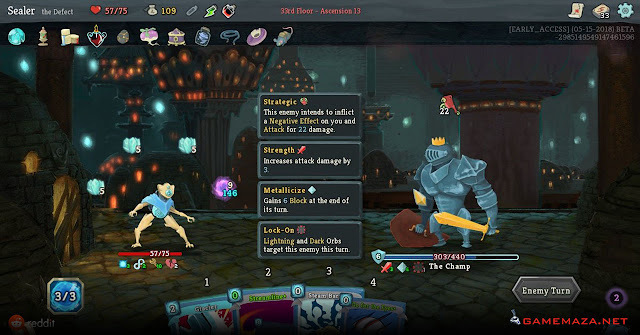 This 'death by a thousand cuts' build is all about playing as many 0-cost attack cards as possible in order to accumulate absurd strength and defense bonuses through relics. Over four or five combat rounds, your pinpricks transform into gouging, 40-damage swings. When this deck is in full motion, it's a chorus of stacking steel as a dozen shivs leave your hand as quickly as they enter. Slay the Spire's playful fantasy art, on the other hand, contributes less to the joy of its combat. Enemies don't animate a whole lot, and as I battled these monsters again and again I found myself exclusively looking at the cards in my hand rather than taking in the fight. Darkest Dungeon remains the pinnacle of this style of art for its skull-rattling 2D combat camerawork, and Slay the Spire might've benefited from this kind of cinematic flare. One other poke I'd make: I don't love that blocking damage feels so central to victory. Tracking down the relics and cards to create ample defense is by no means automatic, but there simply aren't many monsters or bosses that can crack a 100-HP barrier that persists over each turn. Across all three characters, loading up on block was the common thread in my wins. Still, this seems trivial compared to the genre-bending achievement that Slay the Spire represents. At every stage of my own mastery over the Spire's tricks and hazards, meaningful difficulty kept in lockstep. When I beat the game with The Defect's orb-fu, I had to unlearn some of that strategy and wrap my head around the direct damage style of The Ironclad. When losses piled up, a custom mode was waiting for me with a literal checklist of absurd mutators that let me make my own rules, like running a deck with all-rare cards, or trying to win with 1 HP. When I beat everything, I had to beat it all over again, and complete the unlocked, secret final act. The essence of what makes a great card game is readily available here: the joy of building a machine and optimizing it as much as you can. As is the bottomless surprise, the highs and lows of roguelikes. If that isn't enough, recently added moddability is already adding new decks, enemies, and cards to tinker with. Here are the minimum system requirements for Slay the Spire for PC.